Horizon properties provide on-the-fly calculations based on a horizon. 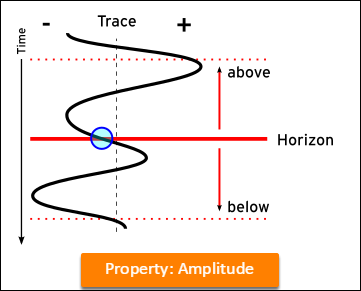 Some properties analyse the currently displayed volume to generate a value, while others, such as dip and curvature, calculate attributes of the horizon itself. 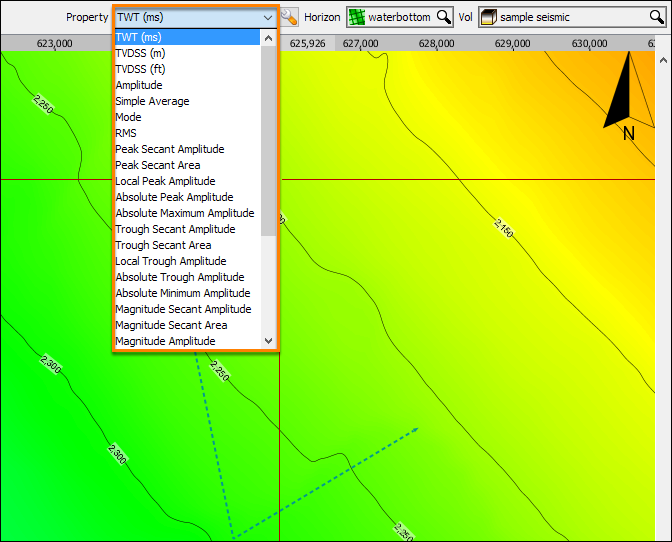 Select the Property to display in the navigation bar of the Map View. To create custom properties or save the results of an on-the-fly property, see Custom Horizon Properties. Some properties operate on a window of values above and below the horizon. See Horizon display and amplitude extraction for details on adjusting the window size and display parameters. Undefined (NaN) values are transparent when a horizon is displayed. Properties at missing horizon locations are also undefined. Amplitude of the sample at the location. The value is interpolated value if the horizon falls between two samples. Amplitude does not use the extraction window. The arithmetic mean of all samples within the window. The quadratic mean (root mean square) of all samples within the window. The mode (most frequent value) of the samples within the window. 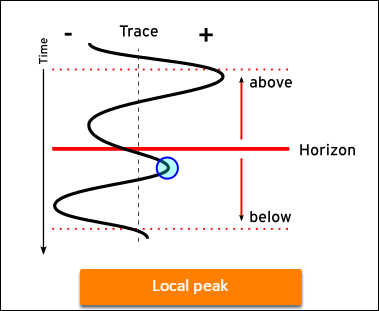 Find the peak or trough nearest to the horizon. If no peak or trough is found within the window, the property is undefined at this location. This differs from absolute peak/trough amplitude in that it stops as soon as it finds a peak/trough, even if there is a larger one further away from the horizon. Find the peak (or trough) with the maximum (or minimum) amplitude within the window. If no peak/trough is found within the window, the property is undefined at this location. Find the absolute maximum/minimum value within the window. It is undefined only if the entire window size of the volume contains undefined samples. This differs from the peak/trough properties in that it will return the maximum/minimum value regardless of whether it is a peak or trough. Find the peak nearest to the horizon. Find the nearest trough above and below that peak, looking outside the window if necessary. If either cannot be found, the property is undefined. Imagine a straight line connecting the two troughs: the “baseline”. 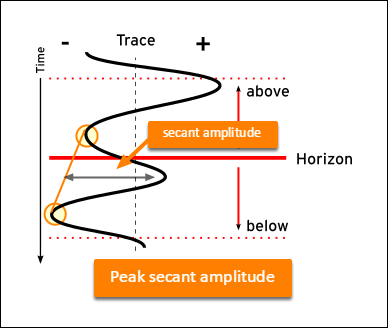 The Peak Secant Amplitude is the difference between the peak amplitude and the baseline amplitude directly beneath the peak. Trough secant amplitude is calculated the same way, around a trough instead of a peak. Imagine a straight line connecting the two troughs: the “baseline”. 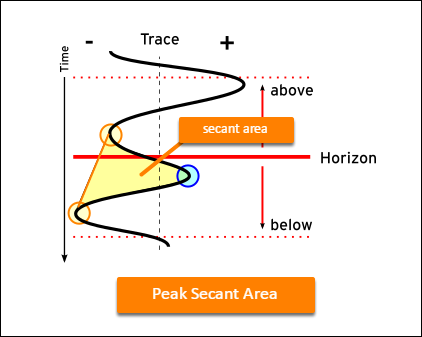 The Peak Secant Area is the area below the peak curve, minus the area below the baseline. When the peak secant area calculation returns a negative value, the property at the location is undefined. Trough secant area is calculated the same way, around a trough instead of a peak. The magnitude properties separately calculate the peak and trough versions of the property and return the largest of the absolute values of the two. 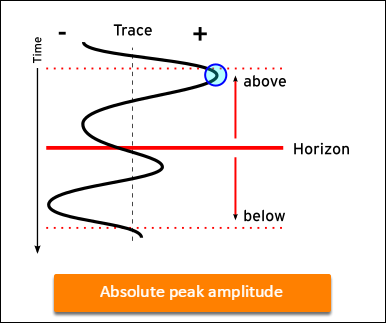 For example: At the horizon, magnitude amplitude finds the peak and trough amplitudes, compares their absolute values and returns the largest. If both peak and trough values are undefined, the property is undefined. Dip angle is the largest angle of deviation downward from the horizontal. Values range from 0 to 90 degrees. Horizon dip is determined by finding the plane of best fit for a 3 x 3 window, and calculating the dot product of the plane, normal to a vertical line. The Dip Angle property requires the horizon to be in depth, or to be convertible to depth. Use "Dip pseudo-angle" to view dip when a horizon is in time and cannot be converted to depth. This is not true angle, but is an indication of the angle in time. 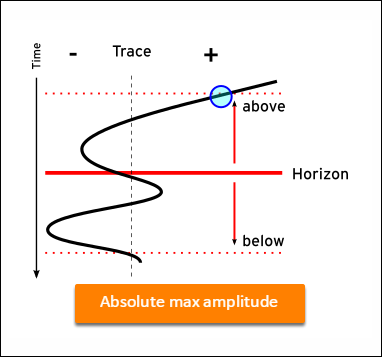 Dip direction is the direction of maximum dip for a horizon. Insight calculates the value by finding the intersection of the plane best fit with the axis and converting it to polar coordinates. Values range from 0 to 360 degrees (compass bearing). Note: The '*' indicates that direction has been calculated from "Dip pseudo-angle". Strike direction is the direction of the line of the intersection between a horizon and a horizontal surface. Use the left-hand rule when interpreting the strike direction, i.e. if you stand facing down a slope with your left hand in front, the strike is expressed in the direction that your thumb points. The value is calculated by adding 90 degrees to the dip direction. Values range from 0 to 360 degrees (compass bearing). 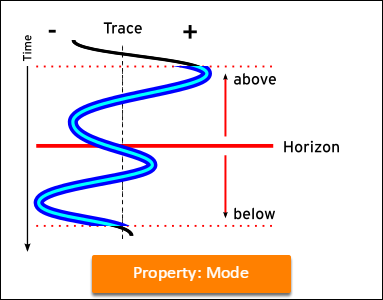 See Structural Curvature for Horizons for details on these attributes.